In the summer of 1913, under the cover of London’s perpetual smoggy dusk, two brilliant minds are pitted against each other—a celebrated gentleman thief and a talented Scotland Yard detective—in the greatest jewel heist of the new century. An exquisite strand of pale pink pearls, worth more than the Hope Diamond, has been bought by a Hatton Garden broker. Word of the “Mona Lisa of Pearls” spreads around the world, captivating jewelers as well as thieves. In transit to London from Paris, the necklace vanishes without a trace. Joseph Grizzard, “the King of Fences,” is the charming leader of a vast gang of thieves in London’s East End. Grizzard grew up on the streets of Whitechapel during the terror of Jack the Ripper to rise to the top of the criminal world. Wealthy, married, and a father, Grizzard still cannot resist the sport of crime, and the pearl necklace proves an irresistible challenge. Inspector Alfred Ward patrols the city’s dark, befogged streets before joining the brand-new division of the Metropolitan Police known as “detectives.” Ward earns his stripes catching some of the great murderers of Victorian London and, at the height of his career, is asked to turn his forensic talents to finding the missing pearls and the thief who stole them. In the spirit of The Great Train Robbery and the tales of Sherlock Holmes, this is the true story of a psychological cat-and-mouse game set against the backdrop of London’s golden Edwardian era. 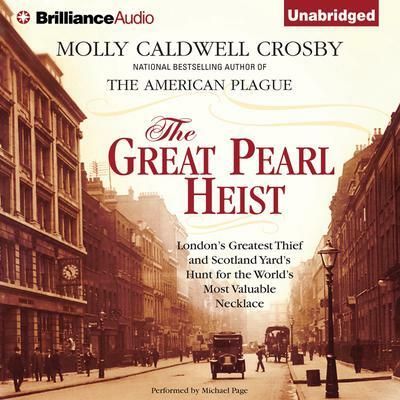 Thoroughly researched, compellingly colorful, The Great Pearl Heist is a gripping narrative account of this little-known, yet extraordinary crime.